Is there a set of closely related keys in modern popular music? If yes, then what will it be? I think you should use a circle of fifths key diagram to compare keys instead of listing our the diatonic triads and then associating keys with the diatonic chords. Yes, various of the diatonic chords IV V vi etc are the tonic chords of closely related keys, but the fact that those are diatonic chords of a key doesn't necessarily mean there is a corresponding key. It's the relationship of the key signatures that makes the close relationship. Clearly you see the problem with looking for keys from the diatonic chords, because you already indicate that there isn't a key for the diminished triads. About parallel keys and the 'easy to get to another key' idea: people sometimes talk about parallel keys or changing mode using the terms interchangeably. Either way the important point is that the tonic doesn't change. In that sense it is a modes change not a key change. If 'easy to get to' is about finding pivot chords to modulate, then no pivot chords are needed to make a mode change. No tonic change. No pivot chords. In that sense it's an easy change. Some distinction should be made between simply borrowing chords from another mode and a real change in mode. Probably the important point being whether the change involves at least a phrase ending on the tonic of a new mode to constitute a mode change. 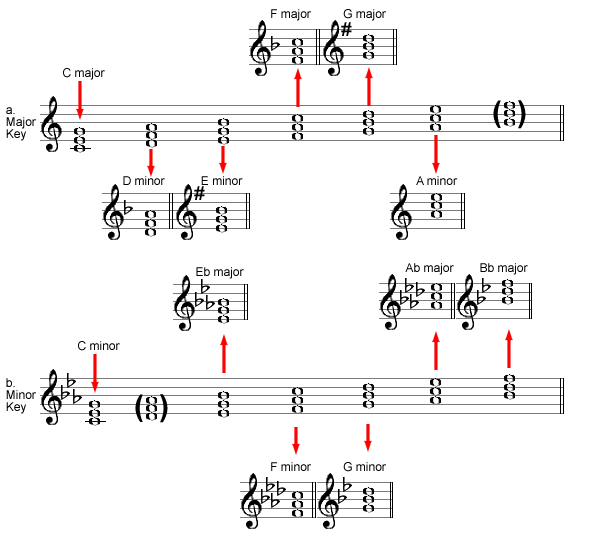 In classical style like Haydn you might have a theme stated in a major key then immediately restated in the parallel minor, then a change directly back to the major, or in a minuet and trio the trio is often in the parallel minor key. Those kinds of changes seem to me proper mode changes rather than borrowed chord harmony. I don't see the point in getting hung up on the exact labels. "Parallel keys aren't closely related keys, because the key signatures differ by more than one accidental." Ok, fine. By definition I can't categorize them as 'closely related.' But, whatever labels and categorizations are used it doesn't change the fact that classical composers would switch directly between parallel keys as a common practice. No special preparation or pivot chords are necessary. If we use the standard definition of differing only by one accidental, then it won't make a difference the style genre of the music. Whatever the style, whatever the key change, if the change is by one accidental it is a closely related key. Similarly, there isn't a set related or permitted key in any style. There are conventional key changes, but not really a fixed list. In classical style the dominant, subdominant, and relative keys are the obvious conventional keys move through. In a very general sense there is even a classical convention to order to changes in a major key work as dominant, relative minor, subdominant, then finally returning to the starting key. But none of that is a fixed requirement or limitation. Pop music will also use the same conventional key changes as classical music. I don't think any closely related key change would be out of place in pop style, and surely multiple example could be found with enough exploring. Pop music often never changes key, but classical style usually does. Excluding theme and variation form, classical form really requires a key change to define the various forms. Pop music fairly commonly modulates directly by shift key up by a step, I see this referred to as a 'truck driver' modulation, I guess because the modulation isn't graceful and apparently truck drivers aren't either. Such modulations are the convention in classical style. You could add those two things to the list of closely related key to get a practical 'set' of key changes for pop music. Not the answer you're looking for? Browse other questions tagged theory harmony or ask your own question. Is there such a thing as “pop music theory”? Are there any prominent examples of music based on random pitches in a pitch class set?